After a nice lunch of Santa Maria style BBQ tri tip at a Slow Food San Diego event with our friends Arne and Gisela, we were treated to a few glasses of Gisela's home-made white wine out on the deck overlooking their beautiful vegetable garden. Gisela was kind enough to send us home with some just picked produce. She has monster-sized roma tomatoes growing, and gave us one along with a nice cucumber. Gazpacho for dinner it was! 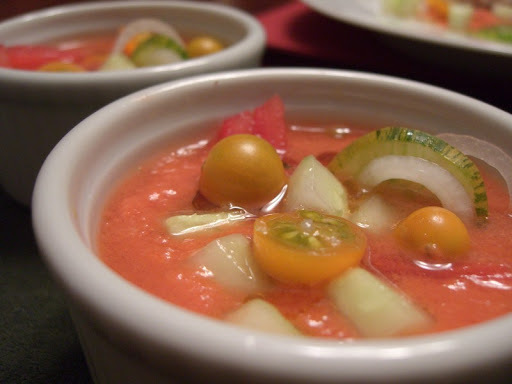 We have made gazpacho from a number of different recipes over the years. Our current recipe of choice is adapted from Tapas: A Taste of Spain in America , by José Andrés. It omits the bread component making it lighter than others, and we enjoy the crunch and freshness of the "garnishes". Ours has extra cucumber and green pepper, and uses red wine vinegar rather than sherry vinegar. We've found that these changes make the soup brighter and more refreshing on a warm summer evening. This time we had the gazpacho two ways: as a kind of a sauce which we had with some simple chicken cooked on the grill, and also as a cup of soup by itself. 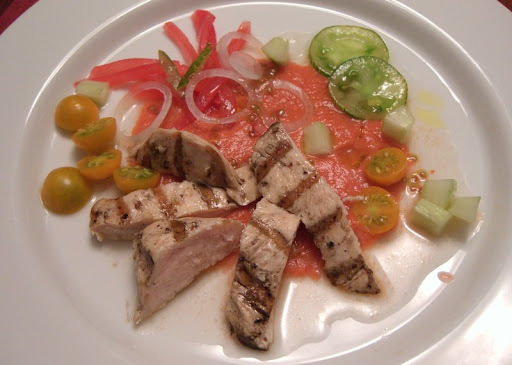 Plating it as a sauce really highlights the "deconstructed" nature of the gazpacho with its garnishes. Makes 4 half-cup servings. While this soup can be made in a food processor, a blender does a better job of creating a smooth puree and incorporating the oil for a more pleasing texture. Cut the tomatoes and green bell pepper into large chunks -- discarding the cores -- and place into a blender. Remove some of the seeds from the cucumber, then chop it into large pieces and add it to the blender. Follow with the garlic, vinegar, and water, then puree in the blender until fairly smooth. Add the olive oil and salt, then puree again. The liquid will turn pinkish rather than red and should thicken somewhat. Taste and add additional salt or vinegar if desired. Chill in the refrigerator for at least 30 minutes. Prepare the garnishes as follows. 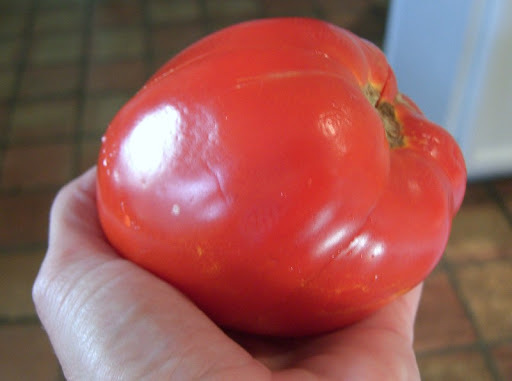 Cut a slice off the top and bottom of each plum tomato, then cut in half lengthwise and remove the seeds. Using a sharp knife, remove the tomato skins by slicing horizontally, keeping the blade flat against the skin and cutting board. Square up the edges of the tomato flesh and slice into strips. Cut the cherry tomatoes into halves, and slice the zebra striped tomato into thin disks. 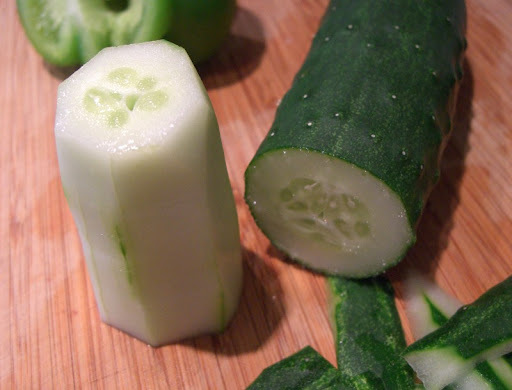 Remove the cucumber seeds and cut the flesh into evenly sized 3/8-inch cubes. Drizzle with vinegar and chill until ready to serve. Just before serving, give the gazpacho a quick stir or pulse of the blender. Put a scant half-cup of soup into each of four 4-oz shallow ramekins. 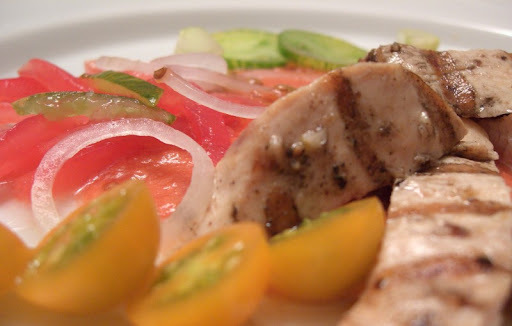 Arrange a few strips of tomato flesh, 6 or 7 cucumber cubes, 6 cherry tomato halves, 1 or 2 slices of the zebra striped tomato and a few onion rings in each serving. Drizzle with olive oil and serve immediately.